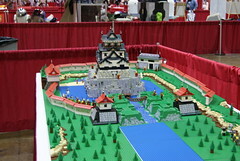 The Greater Florida LEGO User Group located in central Florida will have a LEGO display at MegaCon, at the Orange County Convention Center in Orlando, FL this coming weekend (March 25th-27th). This year, should be a nice mixture of moon-base, space ships, Star Wars dioramas, castle, sculptures, mosaics, and miscellaneous MOCs. If you happen to go to the show, stop by and check out out... and say hello!